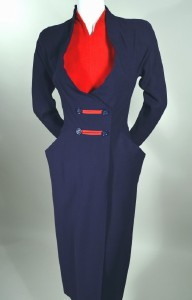 1950's VINTAGE TWO TONE NAVY CREPE WITH RED VELVET SHEATH DRESS - DOROTHY O'HARA SOPHISTICATED GLAMOUR! Late 1940's vintage crepe DOROTHY O'HARA cocktail dress. The draping of this dress is pure brilliance... an architectural marvel! Two tone navy blue light weight, drapey wool crepe and lipstick red velvet. Sculpted neckline with graceful & dramatic self bodice flare that frames the red velvet bib front. Bib is attached to an illusion inner bodice & the front bodice is faced with taffeta all to support the amazing structure of the bodice. Sculpted & notched high tapered neckline accentuates one of the loveliest parts of the feminine figure. Long tapered dolman sleeves. Double breasted front with red velvet faux bound buttonholes & 4 matching buttons. Flared scoop hip pockets left & right. (A girl always needs a good hip pocket, a place to tuck her hands & strike a glamour pose!) Slim cut skirt with wide vertical pleat, giving the appearance of a wrap front. Center back Conmar 21" zipper closure. Self shoulder pads. We've had the pleasure of owning dozens of Dorothy O'Hara's designs over the years; this one stands head and shoulders above the rest! It doesn't have all the lace and embellishments of the others; this one is phenomenal in it's simplicity of detail, yet complexity of design. Talk about inspiration! A California designer & costume designer. In the 40's/50's, designed glamorous fashions that emphasized the curves of the female figure. She designed under the Fashion Forecast, Inc. label. Known as the "sculptress of fabric for garments that featured creative draping. Styles were described as "step-in", with a zipper in the back making the dress easy to slip on and off. Center back length, measured from waist seam to hem edge - 27"
Excellent condition. There are three tiny professional weave repairs which are almost completely invisible. The dress is in amazing condition!